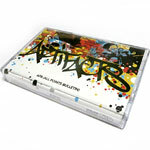 From the fading SMPTE sound and the melancholic opening sax riff to ''Wrong Side Of Da Tracks,'' the Artifacts endeared fans with their back-and-forth wordplay and honest rhyming, paying homage to an oft-forgotten aspect of Hip Hop culture: graffiti art. The New Jersey duo went on a mission of demolition as Tame One and El Da Sensei's lyrical onslaught was perfectly paired with no holds barred production from some of the best boardsmiths of the day. Their aptly titled debut Between a Rock and a Hard Place (1994) symbolized both the blue-collar work ethic Tame and El put forth in their craft and a clever reference to ''Brick City,'' better known as Newark, NJ. This momentum carried over to their second (and final) album That's Them (1997), which showed an ability to grow lyrically while maintaining a strong eye and ear on quality control. Fast-forward to 2014. On this outing, Tame and El team up, reuniting for a rare appearance with Redefinition Records for their latest single ''All Points Bulletin (APB).'' Seattle's Def Dee deftly handles the production duties on Side-A and Germany's Klaus Layer runs the remix on the flip side, but please understand: this is a ''Nu Jeruz'' affair. With that said, Redef provides a home for the two veteran MCs to showcase their talents sans the restrictions and constraints of a corporate machine exerting its will to mold the artists into something artificial versus ''artifact''ual. The music takes on an organic feel and leaves the listener feeling like Tame and El haven?t missed a beat. Rounding out the north NJ connection is K-Def, who lends his mastering prowess to the project. This synergy is felt through geographical bonds and an overall desire to make the best art possible, with more music coming to a speaker near you. Tracks 1-3 produced by Def Dee, 4-6 produced by Klaus Layer.